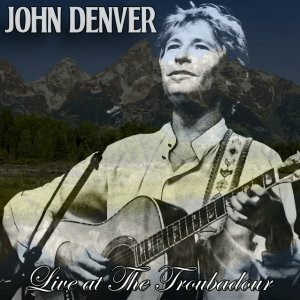 As any fan realises, soundboard John Denver are hard to come by, so here’s a nice radio show. It’s interesting that three years later on An Evening With John Denver, John had roughly the same kind of audience response to Saturday Night In Toledo, Ohio. You could even say that by 1971, he had already honed his live show. Looking back, his Take Me Home anecdote is really touching. Recorded shortly after his first No. 1 hit, this 1971 recording documents the days of John Denver as a folksinger. (At the time) John mostly sings other people’s songs - he only penned four of the songs in this show… John couldn’t stick to the original words on Merle Haggard’s “Okie”, so he adds two verses from Pat Sky’s parody of the song. Hilarious! The three bonus tracks are all from Bandersnatch Coffeehouse, Granville, OH, March 15, 1969. At the time, The Mitchell Trio had already broken up, but it was before John’s first solo album. It was a reel to reel tape and the individual listing it had not listened to it. The tape came from a collection of a Los Angeles radio broadcaster, Will Thornbury (now deceased), whose hobby was documenting all kinds of live broadcasts, mostly jazz but some rock and pop. Some were taped at the station and some on his home equipment. I thought it was worth the risk, so I bought it. I don’t have a reel to reel player, so I enlisted the help of John Marlowe and Cindy McArthur and we got it converted to digital. The quality was better than I had hoped. It was recorded on September 1, 1971 and broadcast the following day on KDAY radio station AM 1580. It is interesting to listen to the stories, particularly the introduction to Take Me Home, Country Roads as it was the No. 1 song in the US at that time. Also, the tape has the only known recording of John singing Tom Paxton’s I Lost My Heart On a 747. 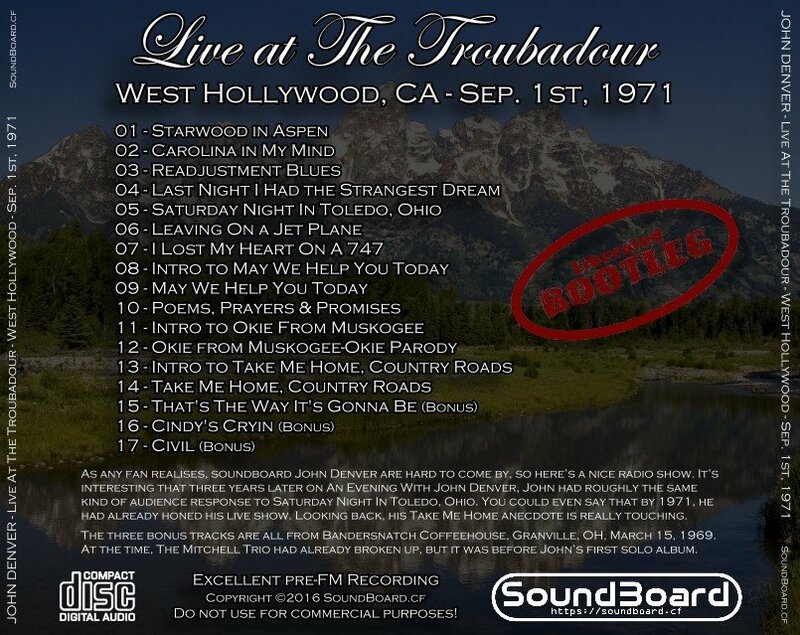 Live At The Troubadour 0 out of 5 based on 0 ratings. 0 user reviews.